Getting married is one of the most important events in any person’s life. The proposal, wedding planning, and the wedding day itself are stories that should be truly memorable. That is why for web bloggers Aileen Apolo and Jay de Jesus, they went a notch higher to share every moment of their lives until they finally walked down the aisle. Aileen and Jay first met during a Digitalfilipino club meeting at the Makati Sports Club back in 2006. Jay was a speaker and it was Aileen’s first time to attend it and go out in public as the Google Country Consultant for the Philippines. 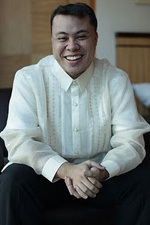 Jay introduced himself to her after the meeting and Aileen told him that she regularly visited his website, Titikpilipino.com. Due to the nature of their work, and as regular bloggers, Aileen and Jay then always see each other during events and seminars. This allowed them to get to know each other better and share their love for Original Pilipino Music. After spending countless time with each other, even ‘accidentally’ celebrating Valentine’s Day together, Aileen and Jay became a couple on September 29, 2007. According to Jay, the best guess she had was that he was giving her a brand new digital camera because of the “3megapixel” letters. In addition to the first clue, Jay also gave her several numbers that she is totally clueless about. “They were actually combinations to four padlocks which were locked in a bag in her parent’s home, which I had opened on the day of the proposal,” says Jay. The bag had a letter inside for her parents signifying Jay’s intention to propose to Aileen that day. “So even if we were thousands of miles away from home, they would immediately know too,” he adds. In Davao, Aileen’s priority number in the zipline was 40, Jay was number 41. But Jay, through the help of their friends, managed to go down first. As Aileen zips her way, she saw Jay waiting for her at the other end with a tarpaulin explaining all the clues he gave, while their friend, Oliver ‘Blogie’ Robillo was holding the tarpaulin with the words “Sweetie will you marry me?” printed on it. When Aileen was reeled in by the crew, Jay went down on one knee and popped the question. Aileen, wobbly and floored by what just transpired, managed to answer him with a resounding ‘yes.’ A video of the proposal can be seen here. Like any other couple, Jay and Aileen had their shares of wedding ups-and-downs. But they made sure that they handled it well and with style. “Since Jay and I lived far apart from each other, we set up a Google Docs Spreadsheet where we collaborated on wedding preparation details. The first thing we did was to set a budget and agree that we are going to be practical on our choices since we both wanted to move out of our parents’ houses,” Aileen reveals. 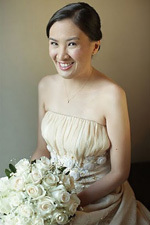 Despite their busy schedules, Aileen and Jay managed to blog about their entire Philippine wedding planning adventures through their respective blogs and their wedding website, AileenJay.com (now offline). 800 days after they first met each other, Aileen and Jay finally took each other’s hand in marriage last December 26, 2009 at the Mary the Queen Parish in Greenhills, San Juan. The solemn Filipino wedding ceremony was attended by their families and close friends from the Internet industry. The reception was held at the NorthEast Greenhills Clubhouse. To make the reception venue more “Jay and Aileen”, the couple made standees per table that says a little something about each person in their entourage, it also depicts the timeline of their love story. They also showed to their wedding guests the infamous zipline wedding proposal video. Afterwards, the two spent their honeymoon in Singapore. Getting married, though, is just the first chapter of their story. The next chapter is harder – the married life. Both Aileen and Jay know that there are more interesting stories in this new chapter. Now that they are married, Mr. and Mrs. De Jesus blog about their everyday adventures as husband and wife. Every now then, they post their experiences and the new things they discover about married life and living together. Like their wedding story, they definitely plan to share these stories as well. Visit Kasal.com Supplier Directory for the contact details of these wedding suppliers.